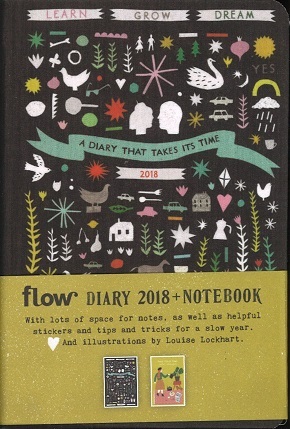 The Flow Diary for 2018 is a pocket sized (95 x 145 mm) journal that takes its time. A diary of slow living. To keep track of your appointments, of course, but also to help you have a quieter life, and a less busy schedule. That's also why we've given this diary a slightly smaller format. In between weeks you will always have two empty pages. They can be used for to-do lists but also for writing down any thoughts you want to remember or inspiring quotes. We hope this diary will motivate you to take time out to do nothing more often, and to have a less busy year. In the back there is an envelope with mini stickers that you can use as reminders that the best things happen by staring at nothing for a bit or to just stop doing useful things for a moment.